Look at how intense this girl is. She is awesome! 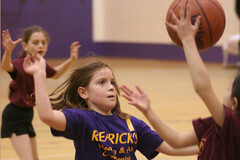 This was at her last basketball game of the season. He teamed sucked a lemon, but Les was about the only good thing on the team! She scored everything for them! As a side note...Ashlee is playing on the basketball team for Oneida. She got to play a couple of minutes during a JV game the other day. She loves it!